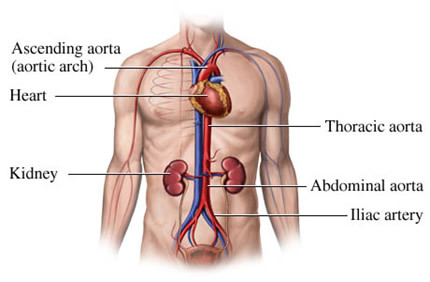 The main artery of the body, which feeds blood to every other blood vessel, is called the aorta. It starts at the heart and passes inside the chest (thoracic aorta) and into the abdomen (abdominal aorta) just in front of the spine. It give branches to the head, limbs and all the organs in the body, supplying blood, oxygen and nutrients that the tissues need to function. At about the level of the umbilicus, it splits into two iliac arteries which supply the pelvis and lower limbs with blood. There are three diseases affecting the aorta which account for the majority of a Vascular Surgeons aortic workload.